People and Society: Public housing 'moderate income' rent rates clarified... with maths! Public housing 'moderate income' rent rates clarified... with maths! Brown Couch reader and mathematician, 'H', issues a quiet 'ahem' following our recent discussion of Housing NSW's 'moderate income' rent rates and their punishing marginal effect. 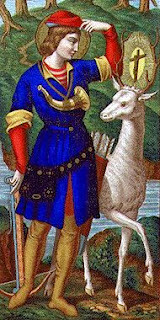 (Just in time for today, the feast day of St Hubertus of Liege, patron saint of mathematics). It's true to say that the average marginal rent rate over the moderate income range is 50 per cent. But there's not a constant marginal rent rate for all the range; the marginal rate varies by up to five per cent either side of the average. The marginal rate at the bottom of the 'moderate income' range is 45 per cent; at the top, it's 55 per cent. Below the moderate income range, the rent you pay increases as a function of the amount of your income increasing, and nothing more; on a graph, this a straightforward straightline function with a constant gradient (in other words, a constant marginal rate of increase). But in the moderate income range, the rent you pay increases as a function of both the amount of income increasing, and the rent rate increasing. That's two orders of increase; so the function is a quadratic, with no constant gradient. Quite so! It is proven: the marginal rent rate in the moderate income range varies between 45 per cent and 55 percent, the average marginal rent rate being 50 per cent. It might be nice if public housing rent rates could be presented as constant marginal rates, like the ATO's income tax rates. It would be nice because it would be clearer for everyone; but on the other hand, a system of marginal rates starting at 25 per cent, jumping up to 50 per cent, then down to 30 per cent is something that no policy maker in their right mind would purposely come up with. Thank you, H, and happy St Hubertus's Day, one and all.